Thanks Bruce. I’m interested in “must confront.” What makes you feel you must confront them? My first thought is to have conversations about the type of culture and relationship the boss wants. Perhaps the boss enjoys having people be afraid. If that’s the case, I can’t think of much you could do. If you can create an organizational win that includes adjusting the way people treat each other, then you don’t have to make it just about their behavior. But, if the boss wants to build a different culture, perhaps there’s hope. However, it’s slow going. Build a relationship built on respecting their strengths. Define the win. In this case, the win is a culture of boldness not fear. Think like a boss. How can we create a culture that gets the best results. Consider approaching this in incremental steps. Speak to an older leader in the same tone you would speak to a mother or father. A few suggestions….but what’s most important is finding a path forward that fits your temperament and style. Thanks Giselle. It’s great to read that a part of this post was confusing. I’m always working toward clarity. In addition, I create space for readers to think by leaving lots of things UNwritten. “Define what you want” in terms of positive results from the confrontation. Do you want stronger relationships, better people skills, or higher productivity as a result of the confrontation. Define the win before you have the conversation. By the way, “stronger, better, and higher,” in the preceding sentence isn’t clear enough. In a confrontation, define what better looks like in behavior terms. But, “don’t practice what you say.” Perhaps over-rehearse is better. Be guided by the win you are trying to achieve. It’s more freeing to enter a conversation being open to what happens than trying to use rehearsed sentences. I also suggest that we think about language you DON’T want to use. You don’t want to create unnecessary defensiveness, for example. Thanks again for pointing out a sentence that was confusing. Very helpful. I too, was struggling to put this point into a context. What does he mean – don’t practice it. Aren’t we meant to model what we want. So thanks Giselle, as I was totally off on the wrong tangent of what was meant. Also thanks for the clarification Dan! Much appreciated. Great blog. Am enjoying following. “Excellence requires confrontation.” Always, but maybe most importantly in education / learning. How can anyone know how well one understands a topic unless she / he is willing to explore that with others, to try using it to address important situations…. I love item #4 in your list: “Define what you want, but don’t practice what you say. Practice makes you sound fake.” First of all, you want to make sure – whether challenging yourself, others, or both – you indeed get the outcomes you seek; if part of a group, involve others in this effort. Second, make sure the tasking real and sharing. For sure, I’d seek to do it in discussion with summarizing for clarity in electronic or print form. Thanks jcbjr. I’m glad you’re coming at this from an education perspective. I find I learn the most when I stay open after hearing something that confronts an assumption. Thanks Bill. A personal illustration brings clarity. “Don’t do that,” is a negative focus that seldom creates a positive future. This is a terrific post. I think we sometimes believe confrontation will hurt feelings or elevate emotions, especially when dealing with “sensitive” people/employees (they read into everything as if it’s a statement on them as a person/worker). The older I get it becomes easier to do this as more “matter of fact”. People seem to respect this especially when emotion is left out of it. Also seems to help me when I’m on the receiving end of it. Thanks Dave. It makes sense that as we grow comfortable addressing tough conversations others will too. Plus, focusing on issues rather than emotion seems freeing. Thanks Franklin. Your inclusion of self-discovery stands out to me. It helps when people see themselves and their values during these types of conversations. No one enjoys feeling pressured to be something they aren’t. This is a great post. There are plenty of people who will confront not because they want to achieve success, but because they want to prove a point, or worse, pick a fight. They would get as much benefit from from this post as those who avoid confrontation all together. I don’t confront lightly, or without good reason, but when I do, I go steady, solid and with an end in mind. You’ve captured this superbly. Thanks Mitch. Ego takes us down a dark path, especially when it comes to “winning” at conflict. Steady, solid, and with an end in mind….sounds like a great strategy. 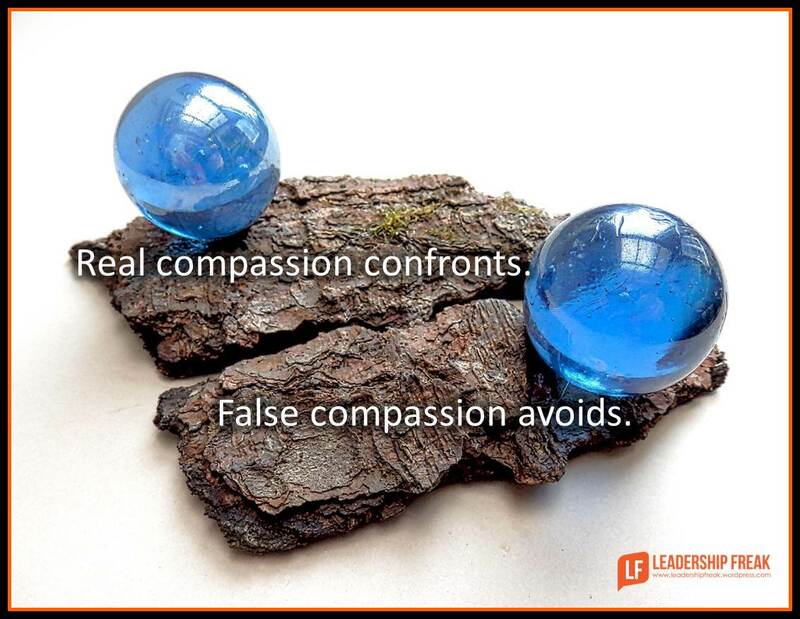 “Leaders who can’t confront live with nagging frustration. ” That is true. When you don’t clarify matters, it leads to mistrust in general. The leader in this case, will perhaps keep judging the team member while the latter remains ignorant of it. Thanks “this.” You got me thinking about the connection between blame and confrontation. Sometimes blamers don’t confront others because they don’t feel responsible. It’s someone else’s fault…not my problem. And sadly the ones who aren’t able to confront people choose to get their way using other methods. I’ve witnessed passive aggressiveness take the place of confrontation. Leaders (and people in general) will employ these tactics to make a point or get their way. It can create an environment of paranoia and hostility. How do you handle P/A in the workplace? Sometimes there are organizational constraints that make a leader reluctant to confront. Typical scenario is that the manager tries to confront constructively, and the employee is resentful and goes over the manager’s head. Managers’s superior second-guesses the manager, and the employee “wins.” It seems that the only way out of that destructive loop is to find a new job. Lots of great comments this morning! It is my experience that the attitude of the person doing the confronting is critical to the outcome. Is your goal to help or hurt the person being confronted. Is the end goal learning, growth, and development, or is it blame? Confrontation done I the right way is absolutely necessary, but done in the wrong way can have significant and lasting negative consequences. This has always been a challenging area for me, so I find the post really hits home and the 12 points will be useful as I continue to go down the leadership journey. You’d think after 35 years of work I would be there, but I guess it never ends:) Thanks! I am generally comfortable with “confrontation” as I worked in negotiations and conflict resolution over the years. As a general rule, I see more and more individuals in positions of authority who are “afraid of confrontation.” I solve problems and that usually means confronting something that needs fixed. I spend much more time these days dealing with the “feelings” involved than addressing the situation straight forward. Sometimes, I’ve even wonder if some people have learned that if they exhibit signs of hurt feelings, it makes people less likely to confront things involving them – perhaps a type of unconscious manipulation they learned along the way.